Check out my blog entry on this new vase! Welcome to my world of ceramic art! ​I hand build all of my one-of-a-kind pottery pieces using the hard and soft slab method as opposed to throwing on the wheel. This method allows for a more organic feel and a greater artistic range of shapes and sizes. Each piece has its own unique personality achieved by incorporating found objects or my own handmade stamps to add interesting textures. I especially enjoy experimenting with glaze combinations. Many people like to simply display my pieces in their home or office, but they can also be used functionally. The bowls, trays, vases and teapots are oven and microwave safe and all the glazes I use are food safe. 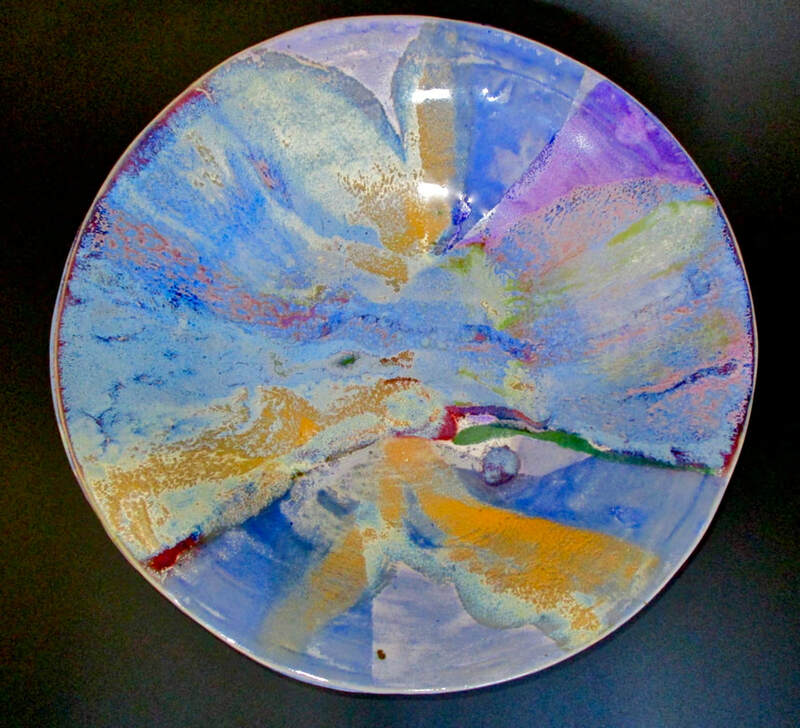 The colorful plate at the top of the page is one of my latest endeavors in a new glazing technique. In order to achieve a seascape or landscape likeness, I dip and pour glazes in a specific order. That being said, I don't have a lot of control where the glazes travel on the surface. It is all dependent on the thickness of each particular glaze, the angle I am pouring at, and the unique surface of each piece. As in much of ceramics, this is yet another area where I have learned to let go of control as an artist and allow the magic of firing to work on its own. Pictured above are a sampling of my Gratitude Boxes. They come in various shapes and sizes with their own colorful slips of paper and tiny pencil for you to write what you are grateful for.